When I was a sophomore in college, I took part in a televised debate about the future of the Western Washington University football program. It was the early eighties, and the state, like much of the nation, was mired in recession. Staff layoffs were looming, and some untenured professors were in danger of losing their jobs. For people who didn’t care about football—or found the sport immoral—this was the time to scrap the football program forever. My opponent was Greg Sobel, who at the time was the student body president. While Sobel marshaled his facts and figures, I fell back on an organic conservative argument that I had learned from one of my political theory textbooks. This wasn’t Adam Smith’s economics, concerning the “invisible hand” of the marketplace. It was the thinking of the late-eighteenth-century British statesman Edmund Burke, an astute critic of the French Revolution: Change should be gradual; don’t scrap a venerable institution—in this case, a college football program that had endured at least 80 years but eventually was terminated in 2oo9. When I debated Sobel under the lights of the television studio, I was almost entirely at ease. But this post isn’t about football; nor is it about the French Revolution. It’s about how wary I am these days of speaking publicly without a text in my hands. 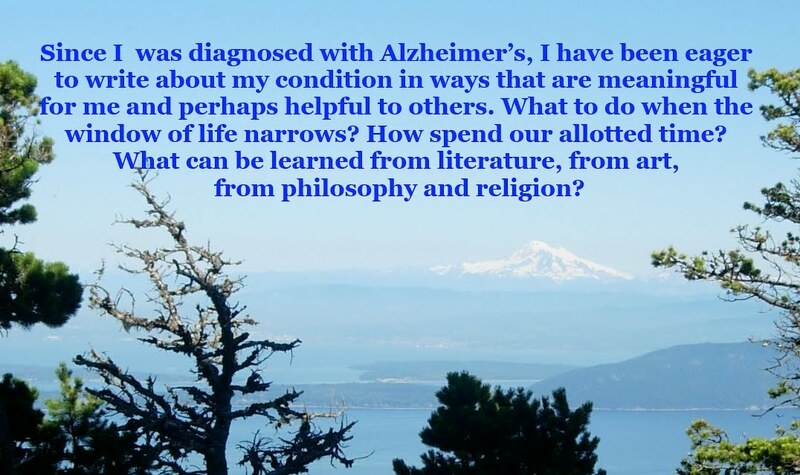 Roughly two years ago, when I was part of a panel discussion about Alzheimer’s, in Brockton, Massachusetts, I had no difficulty speaking fluidly in front of an audience. But in November, in a very similar situation, I was feeling anxious. I did bring a prepared statement, but in the spirit of the forum, I was determined to field any questions that came my way. It is no surprise that, given that I’m now five-and-one-half years down the Alzheimer’s trail, that I would be experiencing more pronounced difficulties with the spoken word. But I didn’t anticipate just how steadily my train-of-thought function has been deteriorating. This last May, I rode with several friends to see a friend’s play in upstate New York. For hours, another friend of mine and I conversed. Over the two-day trip I lost my train of thought many, many times. Much more awkward was a recent incident in Marlborough, Massachusetts, on November 9. Just before the forum, I started writing notes of what I wanted to speak to, but soon the panel discussion was underway, and I felt ill-prepared. And sure enough, when I launched into my answer, within a matter of 15 or 20 seconds, I lost my train of thought. I’m not sure anyone see my face go red; I could certainly feel it. I was now on a bridge to nowhere, in front of perhaps 200 people. I did manage to get back on track, and I even drew some laughs when I imitated the electronic male voice that spoke to me when I was trying to add more credit to my subway pass: You’re running out of time. You’re running out of time. Still, the experience in Marlborough humbling. I wish that the book Seven Steps to Managing Your Memory: What’s Normal, What’s Not, and What to Do About It was in print during the second half of 2013 when I was first showing prominent symptoms of early-onset Alzheimer’s. It would have saved me a lot of anguish over the next couple of years. Sure, either way, I would have ended up with a diagnosis of Alzheimer’s. But by reading “Seven Steps,” I could have learned what was likely ahead of me, and dispel my worst fears. Instead, I found myself in a downward spiral. Neither my editor nor my department head could account for my poor performance. And how could have they? For more than eight years I earned solid performance reviews, but now I was struggling. No one at my workplace suggested that I might have Alzheimer’s or some other form of dementia. It was all beyond our comprehension. The book, recently published, is exceedingly practical. The authors are Dr. Andrew E. Budson and Maureen O’Connor, an assistant professor at Boston University’s Alzheimer’s Disease Center. The book features many fictional dialogues, involving five characters: an eighty-year-old woman, Mary, who ends up diagnosed with Alzheimer’s; Jack, Sue’s husband; Sara, Jack’s daughter; and Sam, a friend of both Sue and Jack. All of the fictional characters, with the exception of Sara (Jack’s daughter) are 72 or older. By far the most relevant information for me came in a chapter titled, “What Kinds of Memory Problems Are Not Normal?” Starting in the late summer of 2013, I had pronounced difficulties, both in my job and in other facets of my life. My professional shortcomings were duly noted by my employer, with my annual performance evaluation changed from the standard annual review to one review every three months. Even in my leisure time, outside of our home, I was often anxious. One night in August I was planning to meet a friend at a prominent pizza chain, ahead of attending a Red Sox game. I was having problems with my cellphone (it wasn’t the phone I normally used) and my anxiety was rising. Worse, I mixed up Burtucci’s with Pizzeria Uno; both establishments were close to Fenway Park. We still managed to get to our seats before the first pitch was thrown, but my enjoyment of the game, which had playoff implications, was tempered by my anxiety. Before discussing dementia directly, the authors sketch in the role of the dual hippocampus, the seat of short-term memory, one on the left brain, and the other on the right. The two sides of the hippocampus have somewhat different roles, with the left sphere specializing in remembering verbal and factual information, and the right hemisphere and the other sphere for nonverbal and emotional information. Other topics include forming long-term memories. As a header section title declares, “You Need To Pay Attention To Form A Memory.” Otherwise the memory won’t endure. In this first chapter, the authors also bring up false memories, which are common among people with dementia. These aren’t necessarily fantasies; in my case, I think of them as errors of facts. Other “Steps” recommended in this very practical book includes “What Can I Do To Strengthen My Memory?” and “Which Memory Aids Are Helpful?” The answer is that, for me, I am now taking daily supplements of vitamin D, along with B12 vitamins, which I I’ve been taking daily for at least a year. I gather that the efficacy of these supplements are limited. But, as far as I can tell, there is no downside of these supplements—unless you can’t stomach the dosage, as I recently learned. Yet when you’re facing an adversary like Alzheimer’s, you should do whatever you can do, even if the upside is marginal.